Revolution Slider Error: Slider with alias bfdha-home-page not found. With just a mere two months to go, it’s not long before the crème de la crème of Birmingham’s culinary and hospitality sectors, gather together under one roof to toast the best of Brum! 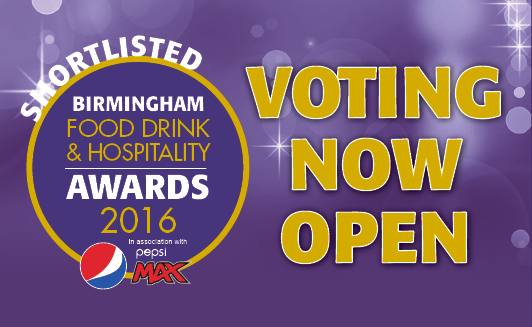 Yes, the Birmingham Food, Drink & Hospitality Awards 2016, in association with Pepsi Max, is on the home stretch as the eagerly awaited shortlist is announced. Our fabulous judging panel have done their part, now the fates of our hopeful nominees lie in the hands of the brimming Birmingham public. Is there a restaurant worthy of commendation? Or a chef that you think demonstrates flair and innovation? Well now’s your chance to celebrate the best of Birmingham by voting for your chosen individual or organisation for a sought-after Birmingham Food, Drink & Hospitality Award. And remember, Individuals can vote for multiple categories, so get clicking! Taking place at Edgbaston Stadium on the 6th of June and billed as one of the main events of the year, The Birmingham Food, Drinks & Hospitality Awards promises to be a night of delectable delights that you won’t want to miss!